Take your time enjoying the Oak Alley tour and exploring the Big House, grounds, slave cabins, exhibits, and café. Tour leaves from 941 Decatur Street in the French Quarter. Please allow 30 minutes for pick-up. Daily pickup starting at 9:00am. Dress for the weather! We recommend cool, comfortable clothing. Be sure to pack a bottle of water and your sunscreen. Oak Alley plantation gets its name from the spectacular quarter mile tunnel of 28 oak trees that frame the driveway as you approach. Built in 1839 and facing the Mississippi River, the magnificent entrance to Oak Alley Plantation makes it a “Must See” destination on everyone’s list of historic Louisiana sites. This plantation was originally named Bon Séjour (“pleasant sojourn”), but became known as Oak Alley when riverboat passengers floating by marveled at the double row of giant oak trees leading to the mansion. 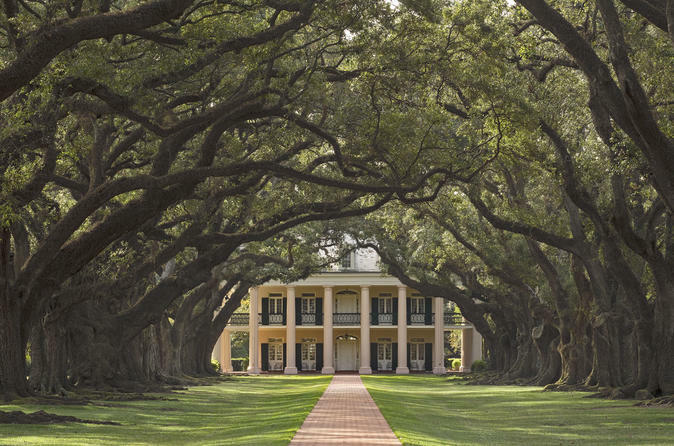 Thanks to its classic appearance and beautiful restoration, Oak Alley Plantation has been featured in a number of movies and TV series, including the movie “Interview with a Vampire,” and Beyonce’s “Deja Vu” music video.